This makes it safe for both visual use with an eyepiece, or astrophotography with a CMOS camera such as the Altair GPCAM or Hypercam. Solar wedges are well known to give a sharper, higher-contrast image than traditional metallized solar film or front-mounted glass solar filters, by eliminating reflections between the filter and front telescope lens. The result is a sharp, very high contrast view of sun spots and solar surface granulation. The Altair Solar Wedge has special anti-reflection coatings on the internal polarising filter and prism. A high specification prism gives the ultimate in sharpness and resolution for imaging and observing. Compared with normal solar film filters, the improvement the Altair Solar Wedge offers is dramatic. Sunspots appear a much darker black against the surface of the sun, with the grey area around the sunspot being very separate and distinct from the darker central area. Many who have never seen fine surface granulation before will see it easily! Wide brightness adjustment range allows imaging AND visual use - in one unit. 115mm backfocus / optical path length enables use with most refractors. Anti Reflection (AR) coated prism and polariser. Quick, easy centering of the sun with glowing spot on rear diffuser. Does not become as hot as other models, thanks to rear energy diffuser. 2" "Positive Lock" compression ring for fast accessory changes. Sturdy CNC machined casing to hold heavy binoviewers or a DSLR camera, filter wheel etc. Safe and easy to use: Unlike cheaper solar wedges which overheat or worse, direct excess energy downwards into the ground, the Altair Imaging-Ready Solar Wedge directs energy into a special extra thick Polycrystalline Ceramic diffuzer disc at the back of the Wedge. Air vents allow air circulation by convection. The Polycrystalline disc has the added benefit of acting like a "solar finder". The sun appears as a "ball of light" on the back of the disc - simply move your telescope until the ball of light is in the centre of the disc, and you are aligned with the sun! One wedge does it all! Both solar photography or visual observation: Often solar wedges don't give enough light for high speed exposures needed to "freeze" air-motion for a sharp image. The Altair Solar Wedge has an AR coated internal polarising filter, which let's you control the brightness of the image. Brightness can be increased or decreased by rotating the top assembly, then locking it in the desired position with a side thumbscrew. Variable brightness is very important both for visual and imaging use, to fine tune the ideal exposure time, or the ideal contrast levels at the eyepiece - especially when adding a colour filter such as a green continuum filter for extra contrast. Unlike other makes, the Altair Solar Wedge enables both visual and imaging applications without having to change internal filters. With the solar wedge in "bright" mode, exposure times as low as 2 milliseconds are routinely possible with high speed CMOS cameras like the Altair Hypercam or GPCAM. This effectively "freezes" the seeing (air movement) resulting in an incredibly sharp image. Here's a 500 frame image of a sunspot group imaged with Altair Solar Wedge by Nick (Altair) during 3rd round of prototype testing on 07-18-2016 @ 12:29:22. Camera - Altair Hypercam IMX174, Altair Flat Field Barlow, with a prototype 125mm ED refractor. 500 frames stacked in Autostakkert, and processed in Registax. Click to enlarge (opens new window). Q: How do I observe the sun safely with a telescope and filter or Solar Wedge? If you view the sun through a telescope or binoculars without a professional filter product, immediate and permanent eye damage will result. This has discouraged people from exploring this fascinating subject, however observing the sun is perfectly safe, provided you use your filter equipment correctly. Each wedge ships with instructions which must be read and understood completely before using the product. Never allow children to observe the sun with a telescope and wedge or filter without the supervision of a knowledgeable adult. Never remove a solar filter or wedge without first placing the front lens cap on the telescope. Always securely fasten solar filters or Solar Wedge securely to the telescope. Always remove any optical finder from the telescope before pointing it at the sun because you could inadvertently look through it. 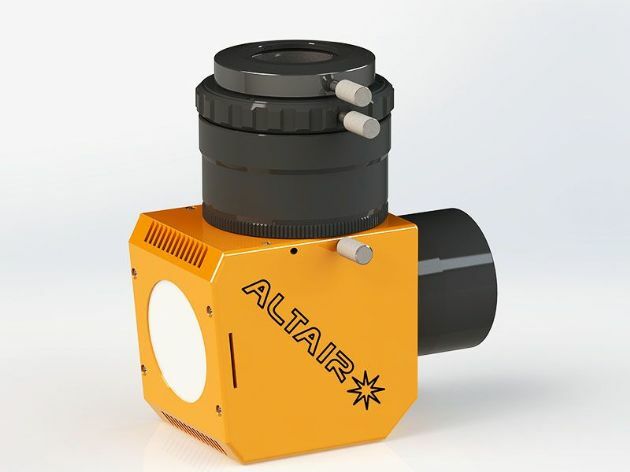 (Use the safe Altair solar finder with Solar Filters or Wedge. Code: SOLARFINDER). Q: How do I set up the Altair Solar Wedge safely? Add the Solar Wedge in place of your existing 2" diagonal mirror. Screw the included Neutral density filter into the base of a low-power 1.25" eyepiece and insert it into the included 1.25" eyepiece holder on the back of the Solar Wedge. Point the telescope at the sun until it's centred in the solar-finder. Remove the front lens cap from the telescope. A glowing ball of light should appear on the translucent disc on the rear of the Altair Solar Wedge. Move the telescope so the glowing ball of light is centred on the disc. Approach the telescope, and look through the eyepiece. If the image is too bright, loosen the locking thumbscrew and turn the turret top until it's a little dim. Fasten the locking screw in this position and remove the eyepiece. Remove the neutral density filter and replace the eyepiece. You can now fine-tune the brightness further by rotating the turret-top and locking it. You will find that high power eyepieces require a little additional brightness compared to low power ones, which is normal. Q: What telescopes can I use with a Solar Herschel Wedge? A: Only refracting telescopes up to 6" (152mm) aperture can be used with the Altair Herschel Solar Wedge. Refracting telescopes have a front objective lens, and rear eyepiece. It is dangerous to use ANY telescope with mirrors with a Herschel Solar Wedge due to the risk of fire and excessive heat from reflections within the tube. This includes Maksutov Cassegrains, Schmidt Cassegrains, Newtonians and Ritchey Chretiens, amongst others. Q: Will the Altair Solar Wedge come to focus with my refractor telescope? The Altair Solar Wedge has an optical path length (also known as "backfocus" of 115mm from the front telescope facing side (excluding the 2" barrel) to the top of the 2" turret where the eyepiece or camera is inserted. This is similar to most 2" mirror diagonals and shorter than most other solar wedges. Please note the 115mm optical path length does not include the 2" to 1.25" adapter, which adds about 5mm extra. Q: Can I used coloured filters like solar continuum filters with the Altair Solar Wedge? A: Yes you can but only if added AFTER the wedge. NEVER add ANY filter in front of a Solar Wedge because it will crack or melt due to the concentrated heat from the sun, damaging the inside of your telescope. Q: How do I SAFELY "tune" the image brightness to get the best view or image? A: When imaging the sun using "lucky" imaging techniques with a high frame rate camera, it's best to keep the exposure duration of the camera as short as possible - ideally under 10 milliseconds, though less than 5ms is even better. This has the benefit of "freezing" the air movement or "seeing" to show granulation and other extreme detail. Being designed for visual or imaging use, the internal polariser module has a wider brightness range than normal Hershel wedges. When set for fast frame rates, the image can appear very bright visually through an eyepiece - like looking at a light bulb. Therefore, a 1.25" neutral density filter is provided, which transmits 75% of light, blocking 25% for initial focusing and setup with an eyepiece. When you first set up the Wedge and align it with the sun, you need to add the provided 1.25" Neutral Density filter to the eyepiece, then rotate the turret-top until the image is quite dim. Then lock the turret top in position with the side-thumbscrew, without turining it and changing the brightness. Once locked in position, you can then remove the neutral density filter, and make final small adjustments. Once you are satisfied with the balance of contrast and sharpness, lock the polariser locking thumbscrew, and you are ready to observe. If using the wedge for imaging only, you can just insert the camera and turn the turret-top until you are satisfied with the exposure duration and gain settings. Q: For how long can you keep the wedge aimed at the sun? One issue with cheaper Hershel Wedges is overheating. The Altair Solar Wedge has been fully tested with the sun remaining in the centre of the field of view for 5 hours of continual exposure with a 6" aperture refractor in mid summer in the UK - without significant heat build-up. At no point did the outer prism housing become too hot to touch, a problem we have often experienced with cheaper wedges.